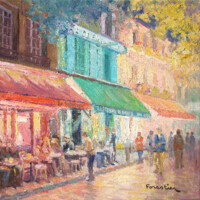 This is a quality impressionist oil painting by listed artist Marc Forestier (born in 1950). It is a wonderful view of a summer day in the village of Grimaud in the south of France. This unique work is hand-painted on a fine linen canvas and signed by the French artist in the lower right corner. 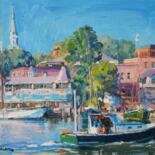 The painting is also signed, dated and titled in the back. Size is 15x18 inches (38x46cm). The painting is delivered with the beautiful golden wood frame visible on the first picture. Size with the frame... Read More This is a quality impressionist oil painting by listed artist Marc Forestier (born in 1950). It is a wonderful view of a summer day in the village of Grimaud in the south of France. This unique work is hand-painted on a fine linen canvas and signed by the French artist in the lower right corner. The painting is also signed, dated and titled in the back. Size is 15x18 inches (38x46cm).